Main Street Cottage is a newly renovated and newly furnished Cape Cod style home in the heart of the lakeside village of Wellington in Prince Edward County. This 2-story house features modern amenities blended with plenty of old character for enjoyment in all four seasons. Relax in the casual elegance of the living and dining rooms as you plan and recount your days in the County. 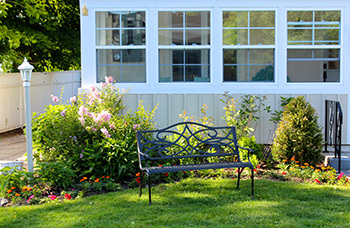 The enclosed sun porch as well as a bench in the front yard offer great places to greet neighbours and watch the world go by along the charming Main Street. Ideally situated to take advantage of what the County has to offer, the picturesque village of Wellington with its gorgeous views of Lake Ontario is home to local studios and galleries, restaurants, heritage architecture and museum, a boardwalk, lighthouse, marina, lakefront playground and public library, all within walking distance of Main Street Cottage. The Main Street also houses several local amenities, including a grocery store, hardware store, pharmacy, post office, bank, LCBO, town hall and churches. In addition, many of the County's wineries are located just a short drive or bike ride away, as are additional shops, galleries and restaurants. Sandbanks Park, North Beach Park and Picton are a 15-20 minute drive from Wellington. Prince Edward County is a unique island getaway in southeastern Ontario offering something for everyone: beautiful beaches, scenic back roads for cycling and exploring, a rich collection of colonial architecture, and a vibrant culture featuring fine restaurants and other local culinary delights, wineries, galleries as well as music, theatre, food and art festivals. Main Street Cottage is located 2 hours from Toronto, 3 hours from Ottawa and 4 hours from Montréal. Copyright © 2014 Main Street Cottage. All Rights Reserved.